He who serves me, follows me, says the Lord; and where I am, my servant will also be. O God, You who chose Saint Ivo, Your priest, as a distinguished servant for the welfare of souls and as an advocate for the needs of the poor. Grant that we may imitate his charity and be protected in answer to his prayers. Saint Ivo (Ives; 1253-1303) studied civil and canon law, Scripture and was known for his prudence, rectitude and the practice of charity. 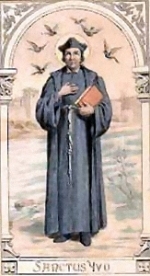 He joined the Franciscan Tertiaries (today known as the Secular Franciscan Order). In time he was ordained to the minor orders and then to the priesthood. Ivo’s good and holy preaching was well known among the people of Brittany leading others to change their lives to adhere to Christ more closely. In the service of the bishop he worked to prevent the state’s encroachment on the Church and he made sure the poor’s needs were met. Tradition has Saint Ivo as a patron of lawyers but not their model as exemplied in a translation of a Latin phrase: Saint Ivo was a Breton, a lawyer and not a thief, a marvelous thing for the people.